More often than not, I am insecure in who I am as a wife, mother, sister, or friend. And, occasionally (or maybe even a little more often than occasionally), I allow my insecurities to get the upper hand in my life, causing me to go into seclusion mode and wallow in self-pity. Yep, I sure do. It all starts by comparing myself to others, and then I begin thinking I'm not good enough. Can you relate? What exactly are insecurities? They are the things that make you lack confidence in your abilities, to be hesitant, indecisive, or doubtful. To put it another way, though, they are lies from Satan meant to disable Christians in their service for the Lord. You have no real purpose in this world. If you were to disappear, no one would really notice. Compare yourself to HER. You should be doing what SHE is doing. You are ruining your children's lives. Why does he love to whisper these things to me? Because I tend to listen. (After all, everyone likes to be listened to, right?) And, when I listen to him, I stop listening to God. And, when I stop listening to God, I become useless as His servant. That's Satan's goal! That's what he wants to make happen in EVERY. CHRISTIAN'S. LIFE. He knows that he can't take away our salvation, but what he CAN do is put lies into our heads and make us feel worthless. Can you relate? 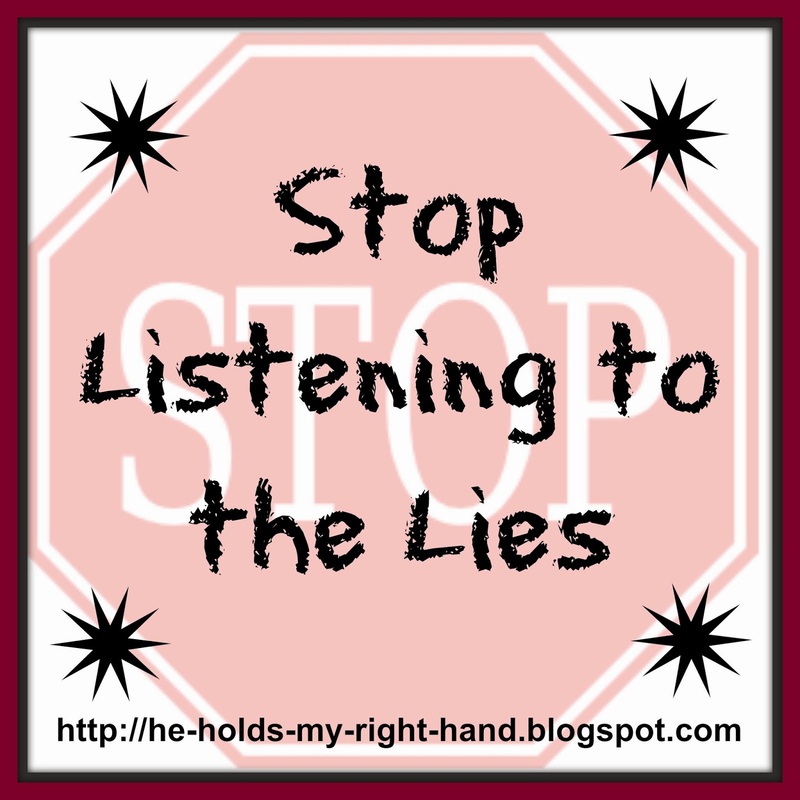 How do we combat the lies, then, and STOP listening to those negative thoughts? 1. STOP AND THINK. Does this thought agree with Scripture? If not, then it is not from God. 2. STOP AND PRAY. Ask the Lord to help you think only on the truthful thoughts that HE gives us in His Word. 3. STOP LISTENING TO THE LIES. Look up Scripture verses that tell you the truth, and let your mind dwell on those things instead. Philippians 4:8 - Finally, brothers and sisters, whatever is true, whatever is noble, whatever is right, whatever is pure, whatever is lovely, whatever is admirable--if anything is excellent or praiseworthy--think about such things. Should we be listening to "the father of all lies" or should we be listening to our Creator? Our Creator knows us. He formed us in our mothers' wombs. So, why on earth would we choose to listen to anyone else! Its hard sometimes, but it has to be a conscious decision to dwell on truth rather than lies. It is something I still struggle with. But, when I listen to what God tells me about myself, I am much more content. What does God tell me about myself? I may not be an "important" person by some standards. I've never done anything AMAZING in the eyes of the world. But, that doesn't matter. What matters is that God has ME here for a reason. I'm not supposed to compare myself to my mom, or my sister, or my friends, or to the pastor's wife, or to anyone else who I come in contact with. I only need to do my best at using the gifts and talents that have been given to ME to serve the Lord on this earth. One reason I am sharing this is so I can have something to refer back to when my thoughts take me in the wrong direction. This world is only temporary, so I don't want to be wasting my time listening to the lies. I want to focus on the truth and be busy for my Lord. I hope you can relate. I can totally relate to all the above. You just admitted what others may try to hide.